I just found this picture from a sign on I-40 and it’s amazing. 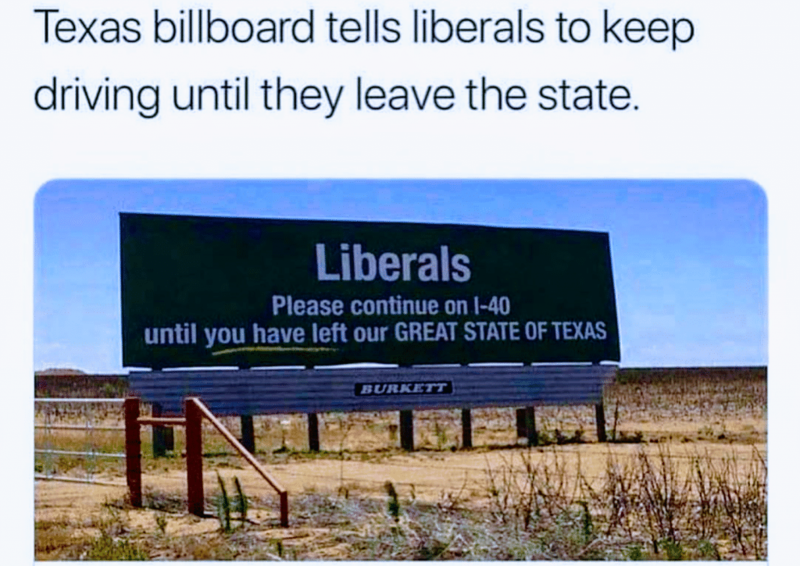 Someone in my great home state of Texas decided they were fed up with all of the Liberals moving to Texas and wanted to make their voice heard. Texas is a RED state – and it’s going to stay that way. Obviously they have a right to move here just like anyone else, but they are delusional if they think Texans will budge on our Conservative policies. There’s a darn good reason why our economy here is doing so well, and it sure isn’t from high taxes. Liberals love Texas for all the Red reasons and now they are going to try and change it Blue. I don’t know about you other Texans, but I’m going to stand up and make sure it stays that way. SHARE if you want to help keep Texas RED! Previous Howard Kurtz: ‘It Certainly Looks Like A Suspension.’ Fox News Faces Volcanic Backlash For Treatment Of Judge Pirro.